How long is the Dream Big 5K Walk route? The Dream Big 5K Walk route has two options to accommodate everyone. A shorter, ADA-friendly course measures 1.1 miles and is contained within the San Diego Surf Cup Sports Park on grass and compact dirt. A longer route is a true 5k (3.1 miles) through a beautiful coastal trail that has moderate terrain surfaces. Jogging strollers are recommended on this route. Both routes follow a closed loop course, which means you’ll finish where you start, regardless of which distance you choose. Which route is best for wheelchairs and strollers? We think you will find the 1.1 mile route to be the smoothest surface for wheelchairs and strollers. More rugged jogging strollers are recommended on the 3.1 mile route, as a portion of the route covers uneven terrain. I would prefer to run on the course, is that allowed? Yes. Please use caution if you plan to run the 3.1 mile course, as some of it is over uneven terrain. Please also be advised the majority of participants will be walking so take caution as you maneuver around them. This is a fun run and will not be officially timed. What is the Start Line process? All walkers must be at the starting line for the Walk start by 8:45 a.m. sharp. For an improved participant experience, we’ll be sending off participants in groups using a wave start system. If you plan on running the course, you’ll want to line up near the front. Will walkers receive an event medal? Participants 17 years of age or younger who complete either Walk course will receive a Dream Big Medal. Are there activities after the Dream Big 5K Walk? Yes, after the Walk, please plan to stay for the Dream Big Festival to enjoy entertainment, a beautiful picnic space, food and beverages for purchase as well as other family-friendly fun. 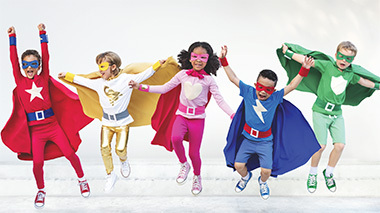 Our inaugural Superhero Sprint will take place for our youngest participants. What is the Superhero Sprint? This is a special short course for children 0-10 years old. How do I enter my child in the Superhero Sprint? You will receive a link to register for the Superhero Sprint when you register for the Walk. When and where will the Superhero Sprint take place? The Superhero Sprint will take place at the official Walk start line in the Dream Big Festival at 10:30 a.m. Anyone who has registered should head to the start line at 10:15 a.m. Superhero capes will be distributed to registered children and age groups will be announced. Can my team dress up for the Dream Big 5K Walk? Can we bring signs? Yes! We encourage you to show your team spirit. Feel free to make signs, dress up and have fun. Remember, this is an event to celebrate kids and your hard work – be creative. Can I bring my pet to the Walk? For the safety of all our participants – big and small – we are not able to allow pets at this event. Only trained service animals are allowed. All traffic will enter through the east entrance of the San Diego Surf Cup Sports Park on Via de la Valle. Please follow the signs and directions of parking personnel. Because of traffic, please allow at least 20 minutes to park and walk the short distance from the parking lot to the San Diego Surf Cup Sports Park field. Is there a separate fee to park? No. Parking is included with your registration fee. Yes, handicap parking will be available at the San Diego Surf Cup Sports Park. To access handicap parking, please look for the designated handicap signs or alert a parking attendant upon arrival and you will be directed to the designated parking zone. If you are registering the day of the Walk or are registered and have not picked up your bib number, please arrive by 7:30 a.m. If you have pre-registered and attended one of the pre-registration events, plan to arrive no later than 8 a.m.
Where do I pick up my Walk Packet? We strongly encourage all team captains and individuals NOT on a team, to pick up Walk packets before the Walk at a Pre-Registration Event. Watch your email for details about the pick-up process. early. Packet pick-up will close promptly at 8:30 a.m. so the events may begin. What incentive is there for registering early? When you register before the Walk, you will have time to build your team and fundraise for a great cause. Registration is just $20 until May 2, and increases to $50 on the day of the event. Parents or legal guardians can register their children during the registration process, but all adults must register and consent to the event waiver themselves. Can I register my spouse and myself at the same time - i.e. as Mr. and Mrs. Smith? Each individual must agree to the waiver separately, so individual registrations are required. Do I have to register my infant/toddler? For planning purposes, everyone who participates in the Walk must be registered. Children under 3 are free. IRS rules do not permit the deduction of registration fees for charity walks/races. All donations made above and beyond the registration fees are 100 percent tax deductible. How will I receive important Dream Big 5K Walk information? We will send important Walk information via email as well as post on our Facebook page, so please “like” us on Facebook at facebook.com/radychildrenswalk and set your spam filters to allow email messages from foundationevents@rchsdfoundation.org and @classy-mail.org. What is the money I raise going to support? Team captains can designate funds during registration to specific departments within the Hospital. Each team can only select one designation from the offered list. Designations need to be noted, by the team captain, on the team home page. Is my registration fee considered part of my fundraising total? Your registration fee does help the Hospital, but it is not part of your fundraising total and does not count toward fundraising rewards. Yes, donations to Rady Children’s Hospital are tax-deductible to the extent allowed by the law. Rady Children’s Hospital-San Diego is a registered 501(c) (3) organization. Our tax identification number is 33-0170626. If I reach the 2nd (3rd, 4th, etc.) tier fundraising level, will I receive all the prizes listed? YES, the Dream Big 5K Walk prizes are cumulative. If you raise $1,000 or more, you will receive all three prizes. Please note that prizes are awarded based on individual donations raised, NOT team fundraising. What fundraising prizes are available? Please visit our Walk website to see our current prizes. Check back regularly to see updates and additions to prizes. In order to qualify for the prizes, all money must be submitted by May 31, 2019. Start by customizing your online fundraising page and reaching out to your contacts. Our development staff is also available to talk through your fundraising ideas and help you to make a plan for success, call 858-966-7878. I want to use social media to connect to my friends and family. Can you help me with this? It’s a great idea to post links to your fundraising page on social media sites like Facebook and Instagram – let your friends know what you’re up to and encourage them to support you. Your fundraising page has easy-to-use social media links. When and how will I receive my fundraising prizes? If you reach the fundraising tier level to receive a prize before the Walk, prizes will be available to pick up at the finish line of the Walk. You can continue to fundraise until May 31. Foundation Office. Prizes not picked up by June 30, 2019, will be donated back to Rady Children’s Hospital. ***Please note: fundraising prizes are awarded for individual fundraising efforts, not team totals. How do I turn in cash or check donations? You can turn those in at the Walk. Look for the registration / fundraising booths. Can I customize my fundraising page? Customizing your page is easy and the best way to get started! As a registered walker, you’ll be able to write your own personal story on your fundraising page and upload your own profile photo, OR you can adopt our Rady Children’s honorary patient story. You also can create a friendly URL for your page – it will begin with https://give.radyfoundation.org/. What is the best way to mail in multiple donations? Please print and complete a pledge form with information for each donation to ensure that you receive the credit you deserve for all your fundraising efforts. Will donations that are turned in at the Dream Big 5K Walk show up on my fundraising page? Yes, donations turned in with appropriate completed pledge forms will be reflected on your fundraising page within one month after the Walk and will be continuously updated as donations continue to be received after the Walk. Can I continue to collect donations after the Dream Big 5K Walk? Absolutely! Participants qualify for fundraising prizes through May 31, 2019. Once your donation is received, you will see your amount reflected in your fundraising total. Many corporations offer to “match” donations from employees to a nonprofit like Rady Children’s. Please contact your human resources department to see if your company has a matching gift program. What if I have additional questions about the website? We’re excited about our website and hope you enjoy the new look. If you have any questions, please don’t hesitate to contact us at 858-966-7878 or foundationevents@rchsd.org.